OSWEGO TOWN, NY – “It’s a beautiful sunny day! Just right to kick off another family reunion season,” exclaimed owner Jason Livesey on Wednesday morning. Old Man Winter conspired to delay opening day. 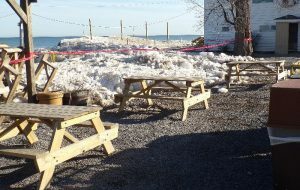 Huge mountains of snow-covered ice bobbed along the Lake Ontario Shoreline – their demise imminent as temperatures will climb into the 50s and perhaps even touch 60 in the coming days. Last year, dozens of hungry patrons shrugged off the snow, ice and wind to welcome the iconic restaurant back for another season. This year, the opening was about a week later than usual to ensure all weather conditions were satisfactory. 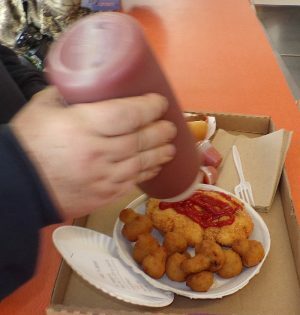 The iconic eatery is celebrating its 73rd season. It’s being run by the third generation of the same family. Shortly after 10 a.m., a few orders had been placed. 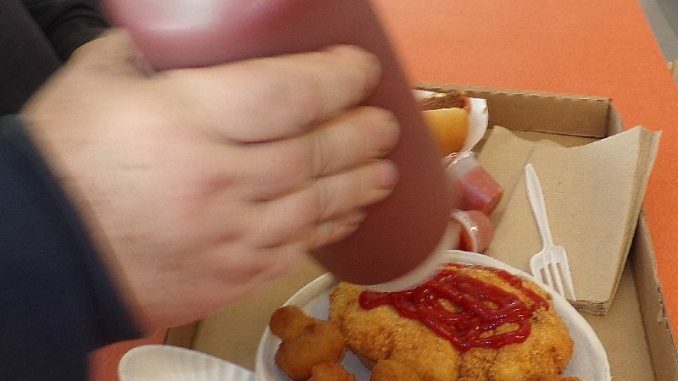 By 11 a.m., close to two dozen patrons had already been served. Jack Beshures was the first to place an order this year. “We’re always excited for opening day, to welcome back people we haven’t seen all winter,” added Livesey. 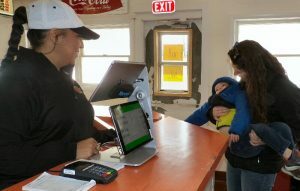 In an attempt to get customers in and out more quickly and efficiently this year, Rudy’s has introduced ordering stations at the east and west ends. 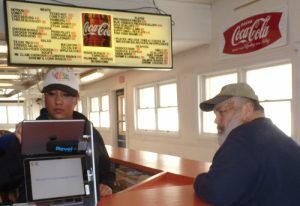 Customers will then move to the center of the diner, receive their orders and exit through the front doors. Kaitlyn Wright and her son, Alexander, made the opening day trip from Liverpool. Debbie Gilmore, usually among the very first customers, was a bit later this year. After the initial rush, there was a brief lull until the lunch crowd. Rudy’s second cousin, Brad Livesey with his wife, Carol (Jason’s parents), bought the restaurant when Gadziala died in 1976. Now it is Spring Time in Oswego. Rudy’s is open for business.